How Does Green Tea Prevent Hair Loss Promote Its Growth? 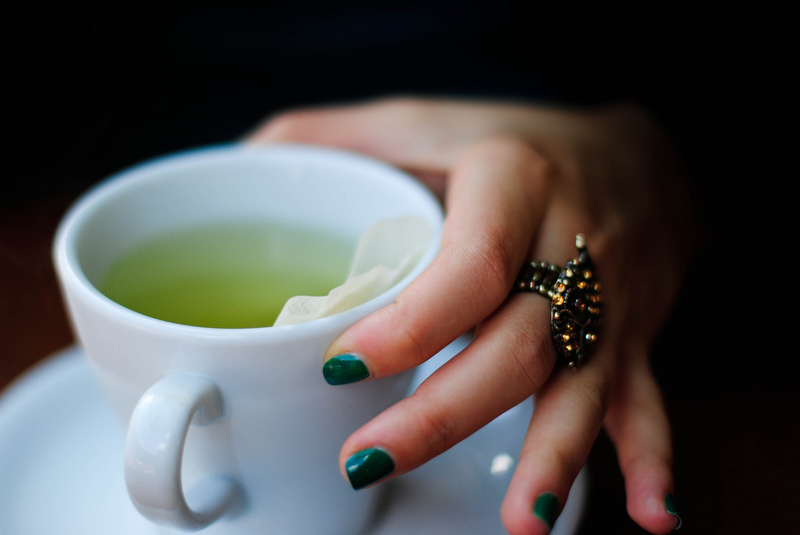 Green tea has lots of health benefits and is regarded as a healthy drink. It has a unique taste and is rich in antioxidants. One thing that many of you may not be well aware of is that it helps in preventing hair loss. Drinking green tea regularly helps in giving you shiny and healthy hair that grows thick and long. So, if you want a beautiful and lustrous hair, drink green tea every day. If you still don’t believe, read on and see for yourself the benefits of green tea for hair. The anti-inflammatory properties of this drink helps in reducing hair fall and also stimulates the growth of new hair strands. So, you can stay assured that you hair will grow healthy and strong. After you shampoo your hair, rinse your hair with a cup of green tea. This helps in destroying bacteria and fungi that may be present in the scalp. These are not usually diagnosed and may cause harm to your hair. So, by rinsing your hair with green tea, you can easily destroy these harmful parasites. These parasites found in the scalp can make the hair roots weak and as a result lead to hair fall. Many people suffer from hair loss due to stress and depression. These are considered as one of the major causes fall hair loss. Drinking green tea regularly helps in fighting stress and depression and making you calm and relaxed. This in turn aids in reducing hair fall. Green tea is rich in catechins and these help in suppressing the DHT in the hair follicles. DHT or dihydrotestosterone is one of the main causes for hair loss. So, by drinking green tea regularly, you can prevent hair fall to a large extent. Green tea extract also contains a number of other components that are essential for your hair to grow well. Carotenoids, zinc, chromium, tacopherols, selenium, ascorbic acids and manganese are some of the essential components found in green tea. All these components, except for manganese and chromium, are needed for the hair to grow well and to prevent hair fall. Green tea contains EGCG or epigallocatechin gallate, which is a polyphenol that helps in making the hair roots strong and activating the hair follicles. This in turn stimulates the growth of hair. So, if you are suffering from hair fall, have green tea and you can greatly reduce hair fall. You can get the maximum results only if you include green tea in your daily routine and have it regularly. By consuming green tea twice every day, you can get results within a few weeks. Many of you may not like the taste of hot green tea and find it difficult to drink it daily. In that case you can drink cold green tea, which is as beneficial as hot green tea. Nowadays you also get green tea pills in the market. Those who find it hard to drink green tea may have these pills to get the benefits of green tea. They are made by using the extracts of green tea and help you in reducing hair fall and increasing the growth of hair. Many of the ayurvedic and herbal hair care products contain green tea as one of the main ingredients. So you can try these instead of shampoos lotions and conditions that contain chemicals. By using these ayurvedic and herbal hair care products regularly, you can prevent hair loss and stimulate the growth of hair. Although it is recommended that you drink green tea two times daily for preventing hair loss in a natural way, you must take care not to consume it in large quantities. Just two cups is enough. If you have it in large quantities, you may suffer from insomnia. The reason is that green tea contains caffeine, which can prevent sleep. Excessive drinking of green tea can also cause stomach irritation in some people. So you must refrain from drinking too much of green tea. When you use natural or herbal remedies, you must remember that it take some time to show the result. So you have to wait for a few weeks and be patient when you use them for preventing hair loss or for any other disorders. Now that you have seen the benefits of green tea, you can switch from your regular tea to green tea. It not only helps you in reducing weight and preventing tooth decay, but it also stimulated the growth of hair by reducing hair loss. How Green Tea Helps in Hair Growth? Take 1 cup of water and boil it with 3 to 4 tbsp of green tea. Now add 1 teaspoon each of honey and coconut oil to the green tea. Mix them well and apply it on your hair and scalp. Wash off after 30 minutes. This helps in preventing hair loss. Boil 1 cup of water in a pan and add 2 tbsp of green tea, 1 lemon peel and 3 tbsp of coconut oil to it. Heat for 2 minutes and then cool it. Apply this on your scalp and hair and then rinse it off after 45 minutes. This can reduce dandruff and promote hair growth. Take an egg and beat it with 2 table spoons of strong green tea. Use this as a hair mask. Leave it for one and a half hour and then wash off with mild shampoo. Using this hair mask regularly helps in providing you strong and shiny hair.